Disaster recovery certification for IT professionals is becoming a necessary pre-requisite for anyone involved in business continuity planning, which has taken on added importance since the unfortunate events of September 11th in New York. In the past, IT professionals would plan for major systems faults, but now planning for entire data center destruction is necessary. Business continuity is taken seriously by management in most major corporations, and IT staff with disaster recovery certification are in demand, so much so, that salary and benefits are presently higher for qualified experts. For the foreseeable future, certification from professional IT institutes are likely to better received than general information systems diplomas, mostly due to the complexity of the subject and importance of disaster recovery. Current certification programs are for existing IT personnel already employed in the role and require a minimum amount of experience before being eligible for training, although there does seem to be some flexibility in this rule. Studying online is a popular option for many hard working IT professionals who are able use quiet time in the office to work thru course notes and exercises. Finding a reputable online training provider offering disaster recovery certification is important, every certification provider is different and not all courses are created equal. Consideration should also be given to the assessment criteria for disaster recovery certification examinations, will candidates be able to complete this within the workplace or locally, or is extensive travel to another city required, and if so, how much time away from home needs to be allocated. Conversely, on campus study may be a better option for many students with two or four day seminar style course available. Undertaking disaster recovery certification in person exposes the student to other IT professionals also working towards certification giving opportunities for networking which may be invaluable as disaster recovery planning is undertaken within the workplace. Examinations for disaster recovery certification need to be prepared for since a minimum 75% pass is required to graduate from many courses. The cost of taking the exam is levied for each separate time the exam is taken, and with prices up to several hundred dollars failing and needing to resit could be costly, and is an expense most employers would be unhappy to pay twice. Re-certification every year or every other year may be a constituent requirement of the disaster recovery certification course undertaken, particularly for professionals working in senior business continuity roles within IT. Reasons for ongoing assessment are related to the speed of technology change, something most IT personnel are used to, but with advances in server and networking systems occurring every few months, ongoing assessment is designed to ensure graduates are always working with current theory. 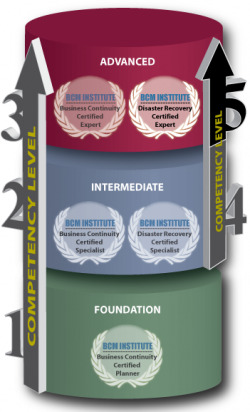 Some of the most popular qualifications for IT professionals in disaster recovery include the Associate Business Continuity Professional (ABCP), Certified Business Continuity Professional (CBCP), Master Business Continuity Professional (MBCP), Business Continuity Certified Planner (BCCP), Business Continuity Certified Specialist (BCCS), Disaster Recovery Certified Specialist (DRCS), Business Continuity Certified Expert (BCCE), Disaster Recovery Certified Expert (DRCE), and Master of Science in Information Security (MSISE). What is a Multimedia Database?